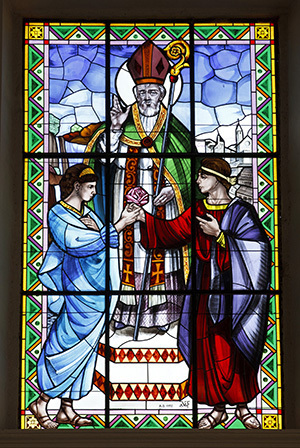 There is no obvious connection about how a third-century cleric and martyr came to symbolize romantic love. There are actually two men from the early Church known as Valentine. The first was a Roman priest. He was decapitated in A.D. 268 for the crime of trying to convert a member of Emperor Claudius the Goth’s household. He also was a renowned healer. The second Valentine was a bishop who was also a renowned healer and was turned over to authorities for converting people to Christianity. He was imprisoned and an attempt was made to force him to sacrifice to pagan gods. When he refused, an attempt was made to club him to death. When that failed, he was beheaded in A.D. 273. One current and credible theory of the romantic connection to Valentine comes from the poet Geoffrey Chaucer. He wrote in a poem in 1375 that it was on Feb. 14 that birds sought out their mate: “For this was sent on Seynt Valentyne’s day, / Whan every foul cometh ther to choose his mate” (from “Parlement of Foules”). And since no record exists of romantic celebrations on Valentine’s Day prior to this poem, it may be the source of the holiday we know today. Beginning in the 14th century, courtly love among the nobles and wealthy began to be celebrated on Feb. 14. The practice gradually spread. Another largely discredited theory held that Valentine’s Day was created as an attempt to supersede the pagan holiday of Lupercalia that was celebrated near the ides of February in Rome. So as best as we can conclude, St. Valentine’s feast day came to be associated with romantic love through Chaucer’s poem. It was really more the day of the feast (Feb.14) than St Valentine himself where the connection was made, since it was on that day that a popular notion held that birds mated up.